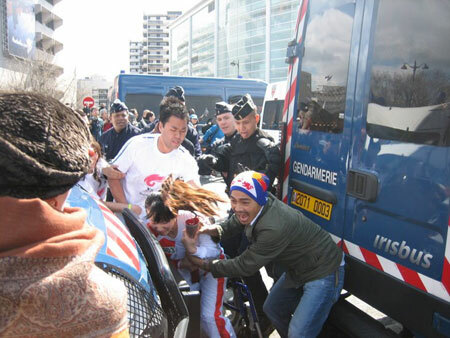 A protestor (R) tries to grab Olympic torch from Jin Jing, a Paralympian torchbearer in wheelchair, during the torch relay in Paris in April 7, 2008. Some French media seemed quite excited about what happened during the Olympic torch relay in Paris a few days ago. Le Figaro ran a headline story titled "The torch's fiasco in Paris", while the top story in La Libération reads as "Give China a slap in the face", describing the "fiasco" in a kind of schaden-freude. Hysterical excitement can be seen in their descriptions. We Chinese people just want to ask: Are these French newspapers remaining the papers once known for being serious and objective? Is this still the country called France that advocates civic virtues and respects other peoples? It is true that the 2008 summer Olympics will be held in Beijing and China's 1.3 billion people are the host. But the torch relay around our globe is the business and glory of the world, not only China's. All Chinese people, and perhaps those in other countries who cherish the Olympic spirit of peace and unity, just cannot accept what had happened in Paris. Naturally when the flame reached Paris, the government of Paris and France is expected to protect it. The Paris Municipal Council and the French Olympic Committee are the organizers of the Paris relay. While seeing such an important sports event organized by Paris Municipal Council and the French Olympic Committee, met a series of troubles and turned out to be a "fiasco", how could the French major newspapers take this as a national pride, other than a shame? Some French media players claimed Paris is a free city and everyone has the right to assembly and demonstrate without government intervention. However, the actions by some extremists to attack the torchbearers, grab the torch and even try to extinguish the flame can no longer be called legal or non-violent protests. Chinese people are seriously disturbed and hurt by the chaotic scene in which an extremist tried to grab the torch from a weak disabled Chinese girl, named Jin Jing, in her arm wheels. Is this the civil French government’s behavior? A slap on China's face, or a slap on France's face? Liberty consists of the freedom to do everything which injures no one else, as is stated clearly in the France's Declaration of the Rights of Man and of the Citizen. We Chinese translate France into "fa guo", which literally means a country that honors the rule of law. The translation itself shows Chinese respect for that country. However, from the joy of headline stories, the editors, reporters and lawmakers who are educated by the French civilization suddenly lost ability to tell right from wrong, and chose adamantly to side with the law-breakers and the criminals. Without doubt, the French should have known that conducting the torch relay means to spread the lofty Olympic spirit. During the process of the relay, many overseas Chinese living in France are welcoming, protecting and shouting support for the torch. That is also their sacred right and showed their opinion and voices on this issue. However, some French media did an astonishing censoring job, ignoring the Chinese voices. Apparently, the editors and reporters have lost their clearness, as they just saw the 'right' of the Tibetan extremists to make trouble and attack the Olympic torch, and totally forgot about the right of the others to spread the Olympic spirit. Sir Pierre De Couberti, founder of the modern Olympics, is sure to get furious if he knows what his compatriots have done. As an ancient country, France has made great contributions to the world. In fact, the Chinese people respect France a lot. France is usually the first that strikes Chinese people's minds when talking about European countries. However, if French media players think they are privileged and have the right to point their dirty fingers at China, they are making a big mistake. Pride and prejudice have obscured their judgment and cast a shadow on this ancient civilization.